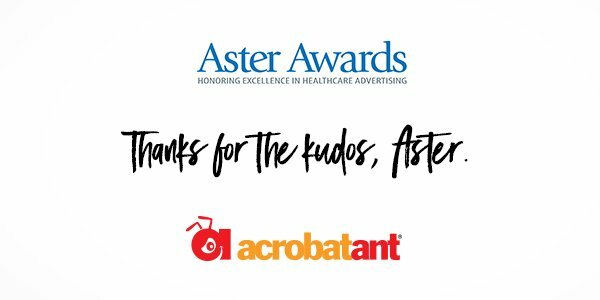 The Aster Awards, one of the largest, most respected national competitions of its kind, has recognized AcrobatAnt for outstanding work on behalf of some of our healthcare clients. The 2018 Aster Awards received thousands of entries from the U.S. and other countries. All entries were reviewed by a panel of industry experts and scored on multiple criteria, with a possible top score of 100 percent. Participants’ entries compete against similar-sized organizations in their specific groups and categories. Judging criteria included creativity, layout and design, functionality, message effectiveness, production quality and overall appeal. All winners are currently posted on the Aster Awards website as well as published in Marketing Healthcare Today, a national healthcare marketing magazine.